It’s official. And in Asian American history, it’s a big deal. 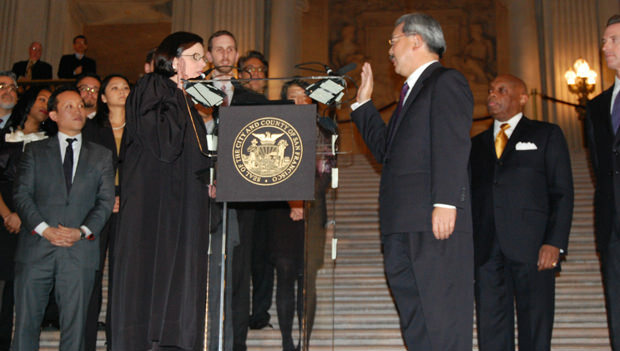 San Francisco’s new mayor is named Lee—Ed Lee, the first Asian American of Chinese descent to hold that position. Anyone who jokes that he’s mayor because they lowered the height requirement, you’ve got to like. Then again, you might just like Lee because he’s so typically Asian American. By all accounts, the former civil rights lawyer turned city technocrat is straight-forward, frugal, and hard-working. Maybe that’s why Lee was the choice of the city’s Board of Supervisors to take over when Gavin Newsom, the photogenic celebrity mayor, left this month to become California’s lieutenant governor. Ed Lee is sworn in as first Chinese American Mayor of San Francisco, flanked by new Board of Supervisors and former mayors Willie Brown and Gavin Newsom. Photo by Francis Tsang. The Seattle-born Lee, your basic suit with a graying mustache, represents a big change in style. He’s a non-glamorous, no-nonsense problem solver, a perfect match for the city’s $360 million deficit. But the only way to properly appreciate Lee’s ascendance is with a real sense of the history involved. Close your eyes and think of China sometime around 1849 when, even without Twitter and text messaging, the news of gold being discovered in California had thousands of Chinese aiming their boats westward. The immigrants called California Gold Mountain, or Gumshan. But most of them never found their wealth in the foothills, leaving them with few options for meaningful work. They became cooks, laundrymen and farmers. Many returned to where the boats dropped them off in Dai Fow, (“Big City”), the phrase used to describe San Francisco. In 1851, the first Chinese laundry opened up in the city. In 1862, California Governor Leland Stanford referred to the Chinese as the “dregs of Asia” and called for their expulsion. The sentiment was a harbinger of the racist legislation that would limit Chinese immigration. The Chinese Exclusion Act was passed by Congress and signed by President Chester Arthur in 1882. Now in 2011, nearly 170 years after those first Chinese communities were established in San Francisco, a Chinese American has become mayor of Dai Fow. We’ve gone from laundryman to mayor, and all it took was seven generations. The Bay Area has had Asian American mayors before. Asian American political legend Norm Mineta was mayor of San Jose in 1967. And Jean Quan just won her bid for mayor of Oakland. But San Francisco has always been the elite jewel of the region, and a prime destination of Asian immigrants. Now one of us is in the top job, and it seems to be coming at a time when Asian Americans in this city, at least politically, have reached a “Gold Mountain” of sorts. Suddenly, there’s no shortage of Asian American power players. Along with Lee as mayor, San Francisco now has four Asian Americans on its Board of Supervisors, led by Board President David Chiu, a Boston transplant. As Asian Americans in San Francisco discover their political muscle, the Asian American community, a third of the city’s population, has never been better represented. I’d love to say unequivocally that Asian Americans in power should make a difference, but frankly, I’m not sure it does anymore. It’s not as easy for the politicos to neglect Asian American issues as it has in the past. How can it when Asian Americans have become the mainstream? It begs the question: should we expect anything different from an Asian American mayor than, say, a white or black mayor? Does an Asian face with power make a difference? We may have reached a point here where our Asian-ness is now less important than it once was. It’s been said that when Obama was elected, America reached a “post-racial” stage. Perhaps that’s just happened in San Francisco. No one believes racism is dead. It’s evolved perhaps. But Lee’s milestone certainly puts us in a new place where inclusion and representation have become more the norm. Or maybe that’s just an illusion, and what we’re seeing is the creation of a new Asian American political micro-climate. Consider a national scene where Asian American political involvement can run from hot to frigid. Hawaii’s had its Ed Lee stories. The East Coast and other areas have not. It’s just happened for the first time here. Still, all we ask of Lee is what we’d ask of anyone in the top office, regardless of race. After Newsom, the city can’t afford to settle for style. Asian Americans want what everyone else wants: strong, competent, and caring leadership. And now an Asian American is in historic position to deliver for all.